>This is the first year I have not been able to make it to the annual family gathering in my hometown. Instead, my parents came down to my tiny tiny apartment with my dog. There were only three of us and none of us are particularly big fans of turkey so we decided to make a non-traditional meal. My parents brought down steak and a veggie tray, and I made crescent rolls (sort of traditional but an absolute must!) 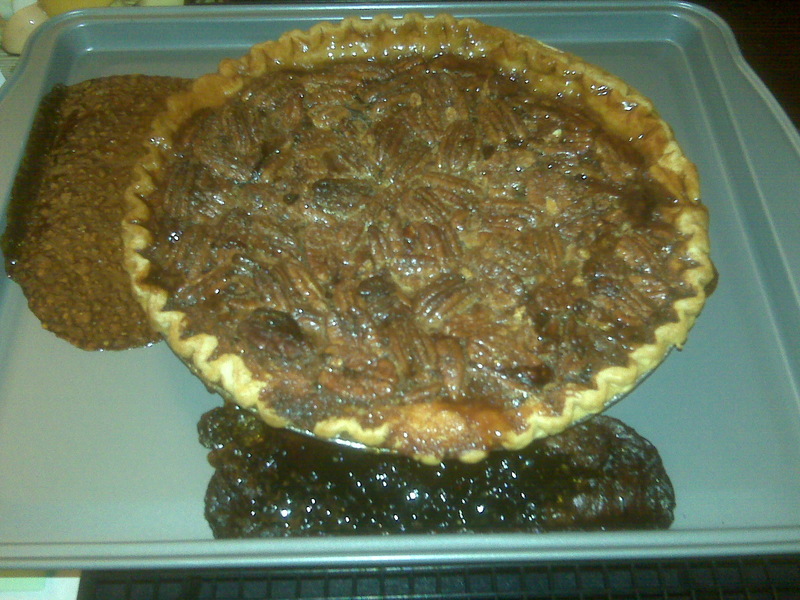 and chocolate, pecan pie with whiskey in it (YUMMY!). My mom also brought along a really good creamy horseradish sauce for the steak! I didn’t miss the dry turkey or the mushing stuffing. I have also never been a fan of the cranberry sauce or any of the weird desserts of the “fluff” or jello and fruit variety. The only things I did miss were the squash (my grandma’s squash is amazing!) and the pumpkin pie (there were only three of us so 2 pies seemed like a but much and my dad doesn’t like pumpkin pie). It was also good because they were gone by early afternoon and then I had the rest of the day to do laundry and homework. It was the most productive Thanksgiving I’ve ever had! What does your family do for Thanksgiving that isn’t traditional? I think one of the best ways to, in my opinion, eat vegetables is a batch of stir fry. Most people eat stir fry with rice but I find that if there’s enough texture between the vegetables it is good by itself or with a chicken breast, which is good because that’s less carbs! Usually, I just put any vegetables I have in a pan with garlic and olive oil. But the best stir fry is planned because some vegetables take a really long to cook in a pan and some take a really short time so it is good to put things in the pan in a planned order. I usually put the garlic and onions in first to get them to flavorize (yep…I just made up a word!) the entire dish. 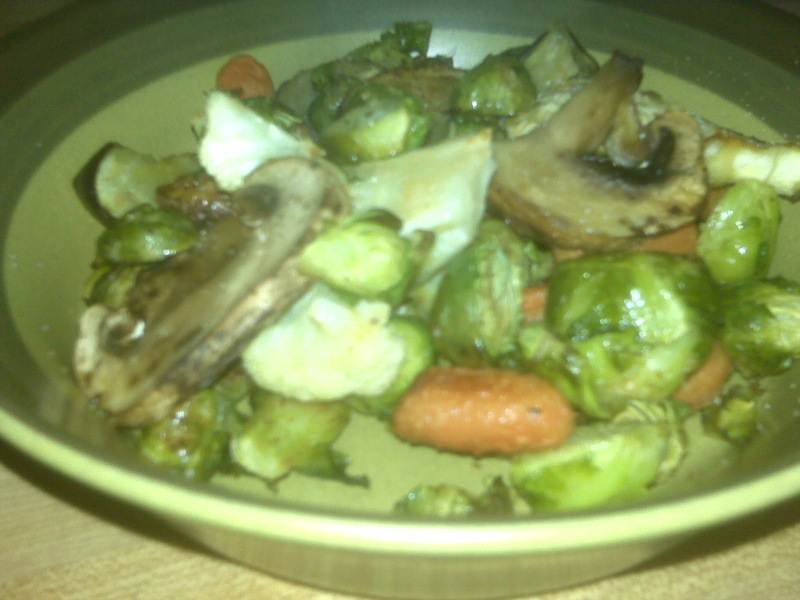 Then I put in potatoes, mushrooms, fresh brussel sprouts and carrots if I have any of those ingredients. Yellow squash, zucchini, broccoli, eggplant and cauliflower go in next. And finally kale, other greens and tomatoes go in right before everything else is done. Other than the garlic I usually put in a bunch of hot sauce and sometimes I put chili powder on the potatoes! Stir fry is a really versatile entree because you can put anything into that you have. I have also put radishes and baby bok choi into a stir fry once. I’m not the biggest fan of making stir fry with meat in it, I usually just make a chicken breast to go with the stir fry. I am interested in trying tofu but am not sure if I should use the crumble or the cubes…any suggestions? >I had to write a short blog post about the Harry Potter 7 opening because I got to see it at a very nice theater. The Sundance Theater has a full service bar and restaurant in addition to the regular popcorn and soda. For the Harry Potter 7 release they had special smoothie flavors for each Harry Potter house, and HP themed appetizers and mixed drinks. The thing I was most looking forward to seeing and possibly tasting was the Butter Beer. I thought it would be like tea or a butterscotch Italian soda but it was much worse than that…it was rootbeer with butterscotch flavoring in it…I didn’t try it because I’m not a fan of rootbeer but for some reason I thought it was going to be warm. Interesting how different people would make food from the same movie! The premiere was great despite the addition of HP themed food and drink! So after my first attempt at using the crock pot (which wasn’t an exact failure…the dish was just really salty) I have made three more meals in my crock pot. The second one was a squash medley stew that had three types of squash, tomatoes, and some other vegetables in it. That turned out pretty good but was essentially a side so I had to make chicken or rice with it every time I wanted to eat the leftovers. The third thing I made was chicken curry stew. I was a little skeptical about making this because I’m not the biggest fan of curry powder and it had a lot of it in the recipe (2 tbs.). So I decided to only put half in and replace the other half with garlic powder. Other than curry powder and garlic powder, the stew had chicken, chick peas, and tomatoes. When I walked in after classes and work my entire apartment smelled like garlic, which is good because I love garlic! The stew turned out to be really really good (with my garlic substitution of course! ), especially after I drained some of the excess liquid off. I think next time, to make it have a little more depth I will add some frozen peas or green beans! The fourth thing I made was Chicken Chili (see picture)…not the white creamy kind that a lot of people associated with chicken chili but a southwestern type of chili. 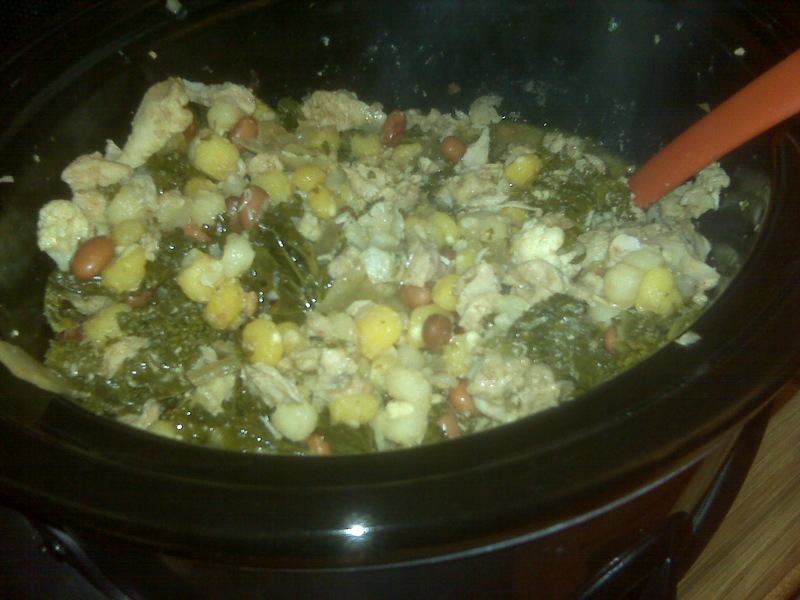 It had chicken, tomatoes, chicken stock, garlic, onions, pinto and hominy in it. I had no idea what hominy was so I Googled it and found that it is a form of processed corn…interesting. When I went to the grocery store I thought about just getting corn but the hominy was the same price so I decided to give it a try. After putting everything in the crock pot I decided, once again, that it needed more vegetables so I added a bunch of chopped up kale. The dish actually had a lot of flavor and a decent amount of spice after I added a squeeze of srachai! It was really good with some chunks of avocado or sour cream. When I made this again I will definitely replace the hominy with corn (it wasn’t bad just had a weird texture…almost like a bean), I will also replace the pinto beans with black beans, and continue to add something green (whether it be kale, peas, or green beans) and the srachai. >This week I went to dinner with a bunch of friends from work. We went to Frida’s. I’ve never been to Frida’s, mostly because my freshman year everyone said the only reason to go to Frida’s was the fact that they have good, cheap margaritas and don’t card. So basically I never wanted to go based on the fact that I had never heard anything too positive about the actual food. So when I got the invite I was excited because I always wanted a reason to go other than the half-priced margaritas! My first impression was that it was a lot bigger than I had pictured because when you walk by all you see is the bar area. But the entire restaurant opens up in the back to a big open space and second floor in the back. We were seated on the second floor which was pretty cool! The menu is pretty typical Mexican-American food with an entire page dedicated to tequila! I ordered a chicken fajita burrito (the only one at the table to order something other than a quesadilla). I always appreciate free chips and salsa at Mexican restaurants and Frida’s did not disappoint. The chips were really good but the salsa was a little lacking in spice for my taste and had a bit too much cilantro in it. My burrito was good…the chicken was grilled and the vegetables inside were very well seasoned. The sauce on top of the burritos was, again, lacking in spice but the refried beans were very good and it came with a good helping of rice, lettuce and sour cream. The prices are a little high for traditional tex-mex food which made it absolutely necessary to fill up on chips and save the second half of my burrito for lunch the next day. All in all, it was good dinner and a great night out with the girls! I have an odd dislike and love for pie. I have never liked Apple pie (but I can eat it if I want something sweet and there’s nothing else around) and I really really dislike other types of fruit pies. I think it is the odd bitterness combined with the dry crust, not sure. However, I absolutely love pumpkin pie and pecan pie. I recently made a pumpkin pie from a can and it was pretty successful so I decided to try my hand at a more difficult pie and make ‘Tipsy Chocolate Pecan Pie.’ It is normal pecan pie but you put chocolate chips on the bottom of the pecans and you add whiskey to pecan mixture. Not many people know this about me but I absolutely love Whiskey and to be able to put it in a pie very so great! I didn’t make the crust because I wasn’t feeling that ambitious so I just bought a frozen crust. All I had to do was sprinkle the chocolate chips in the bottom of the pie crust, mix together the ingredients [corn syrup, pecans, sugar, salt and whiskey] and then bake it for a little less than an hour. It was soo good! I am not sure why it bubbled over so bad (see picture) but I am glad I put it on a baking sheet just in case! It was really good with whipped cream and I could actually taste the whiskey in the gooey pecan middle! It was the perfect pie for the beginning of fall!